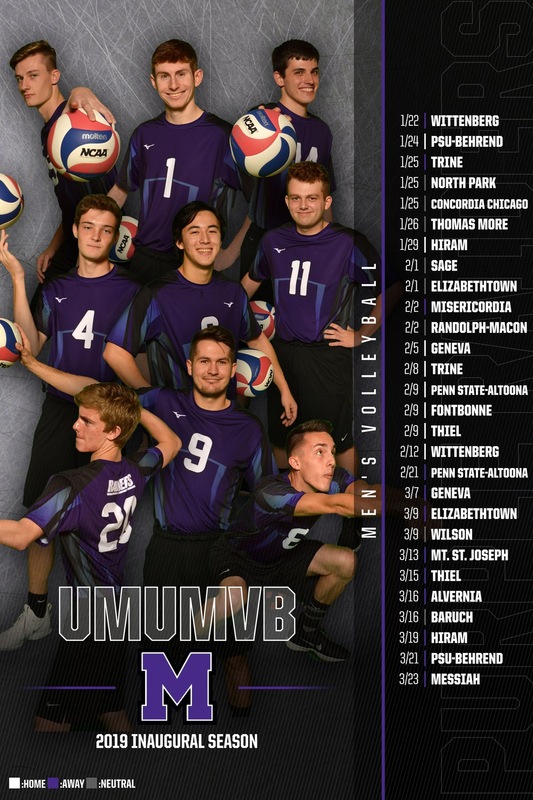 DALLAS, Pa. -- The Mount Union men's volleyball team swept both Sage (N.Y.) and Elizabethtown (Pa.) on the first night of competition at the 2019 Cougar Kick-Off Classic hosted by Misericordia University. The Purple Raiders have now won three consecutive matches, moving their record to 4-5. Against Sage (2-3), freshman opposite hitter Mark Bruns (Columbus/Upper Arlington) led the Raiders with 12 kills, five service aces and four blocks. Most of Bruns' kills came off of freshman setter Jeremy Leyden (Cuyahoga Falls/Archbishop Hoban) who registered 27 assists in the 3-0 victory. Leyden also led the defense as he tallied nine digs, followed by sophomore libero Andrew Chen (Brooklyn City, Minn./Park Center Senior) who had eight. Against Elizabethtown (2-3), three players registered double digit kills in Bruns, sophomore outside hitter Justin Sibbel (Stow/Stow-Munroe Falls) and freshman middle hitter Sam Matonis (Macedonia/Walsh Jesuit); Bruns ahead of the group with 13, while Sibbel and Matonis each had 10. Leyden continued to dish out assists, accounting for 29 of Mount Union's 34. Freshman defensive specialist Cullen Vereb (Jefferson Hills, Pa./Seton LaSalle) led the group with a season-high three service aces in the shutout. At the net, freshman outside hitter Kaleb Krebs (Pittsburgh, Pa./Seton LaSalle) totaled nine blocks against Elizabethtown for a team-best. Chen and Leyden continued to protect Mount Union territory as they collected nine and eight digs, respectively. Mount Union take the floor again Saturday, February 2 with a pair of matches against Misericordia (Pa.) at 11:00 a.m. and Randolph-Macon (Va.) at 1:00 p.m.